Ex-display model. Retail boxed and complete. 1-year warranty. The Humax FVP-5000T 1TB is a HD TV recorder which has Freeview Play and Netflix* built in. Complete with 3 HD tuners, you’ll be able to catch up and record your favourite programmes in more ways than ever before, and it's all so easy to use with a seamless and smart user interface. This adds connected services to the Freeview offering. Within the EPG you'll be able to scroll backwards through the last seven days of programming and select shows to stream over the internet that you might have missed. With Netflix built in to the recorder, stream the latest films and shows. *Please note it is a membership subscription service. The connected content relates only to the channels on offer in the Freeview line up. As such, you can catch up with programmes from the likes of BBC iPlayer, ITV Hub, All 4 and Demand 5. For increased recording versatility, the FVP-5000T has three digital HD tuners. This means that you can record up to four programmes simultaneously, whilst watching a fifth. As a result, you won’t have to miss one show to see another or choose between your favourites. Use the intuitive 7 day programme guide to set recordings and reminders. Use the powerful Smart Search feature to find your favourites, or use 'Top Picks' for recommendations. 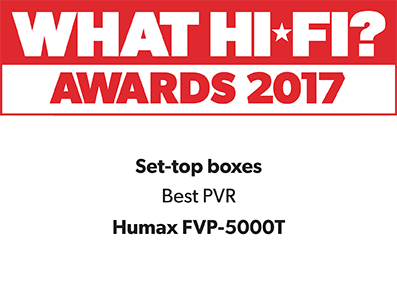 With its 1TB hard drive, the Humax FVP-5000T can store up to 500 hours of standard definition shows (high definition content will differ in file size). The FVP-5000T 1TB offers exciting multimedia and home networking capabilities when connected to the internet via the Wi-Fi, making it the hub of any home. Play media content including photos, videos and MP3s directly onto your TV using a memory device in the USB port. Alternatively connect it to PCs or laptops around the home through your home router or via the Ethernet port. The HD TV recorder is even home networked with DLNA which is ideal for media sharing with other computer devices. With a download of the Humax Live TV app (iOS and Android) you can stream live TV or recordings to your smart device, set reminders and schedule recordings. And all from the convenience of your mobile phone or tablet.